The first recorded Marshall boiler to be manufactured was in 1856 and the following year Marshalls received valuable orders from the Russian Railways for small steam boilers for heating railway carriages. By 1858 Marshalls were producing Cornish type boilers. In the 1860s the manufacture of small vertical boilers commenced and between 1865 and 1871the new Boiler Shop in the North Works was completed. Marshalls obtained a licence in 1888 to manufacture the Hopwood patent water tube vertical boilers and in 1895 the first Marshall-Heine water tube boiler was produced. The new Boiler Shop in the South Works was completed in 1898 and in its first year the new boiler shop produced 1,169 boilers. 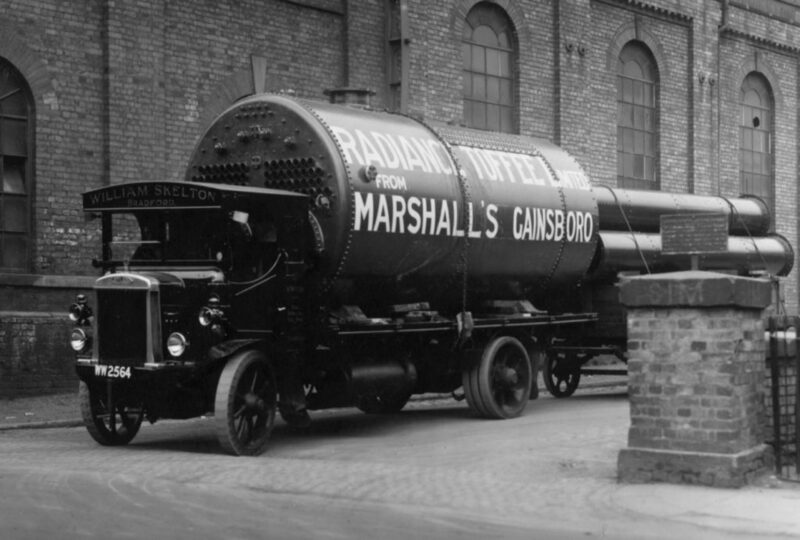 Marshalls developed the cylindrical multi-tube boiler in 1920 available as a fixed and portable version. Provisional agreements were made in 1957 between Marshalls and both Cleaver Brooks, who manufactured both automatic packaged fire tube boilers and distillation plants, and Wickes, who manufactured packaged water tube boilers. A final agreement was signed in April 1959. In 1964 a new range of Marshall Wickes water tube boilers was introduced. In 1970 the new extension to the Boiler Shop was completed and the new Electrode boiler was announced. By 1974 the Gainsborough built Cleaver Brooks ‘CB’ range was superseded by the type ‘FS’ and ‘FW’ range. Only limited progress was made with these promising new boilers before the sale of Marshall-Fowler to Aveling Barford in 1975. The Thermal Division was retained by Wards and so the production of boilers made by Marshalls ceased, after 120 years.